In my student teaching, we were asked to make graphs to assess the improvement of our students' knowledge over a unit of material within our subject area. So I had bar graphs on the brain as I prepared for this KCBW challenge. 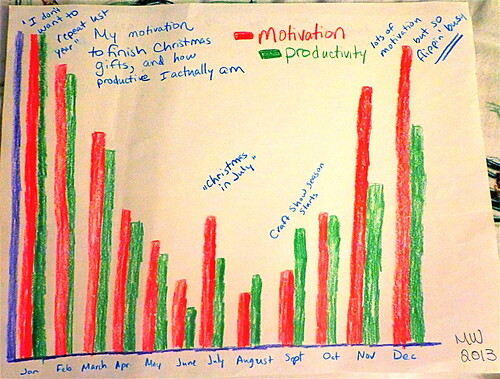 With lots of extra time in my last week of student teaching, I prepared this graphic to show my motivation versus my productivity throughout the yarn in regards to making Christmas gifts. As you can see, motivation and productivity is high in January, as "I don't want to repeat last year", and it slows down come spring, with a "Christmas in July" peak in motivation (though not necessarily in productivity), a productivity increase during craft show season, and finally in December "lots of motivation, but so flippin' busy". I had a lot of fun coming up with an idea for this challenge, and I hope you enjoyed viewing my infographic. haha, love the bar graph!